Winter in San Diego is the place to be! With the exception of the occasional rainy day, skies are generally blue during one of the coldest times of year around the rest of the country. In fact, it’s not unusual to find yourself reading your novel on the beach as your kids play in the sand. To top it off, San Diego stops at nothing when it comes to getting into the spirit of the holidays! 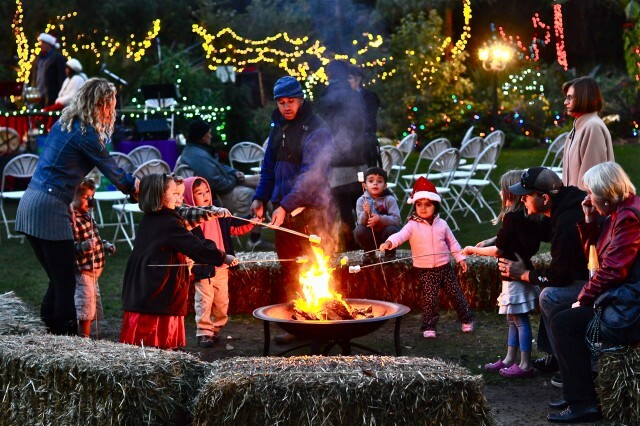 The entire county literally lights up and there’s plenty of activities to help make memorable moments that will last a lifetime for the whole family. Here are some of my favorite things to do in San Diego during the holidays. Skating by the Sea at The Del! Okay, you may be thinking that I mentioned you would be on the beach…Well, if you head to Coronado’s Ice Rink you can enjoy the view of the ocean and test your balance skating on ice! 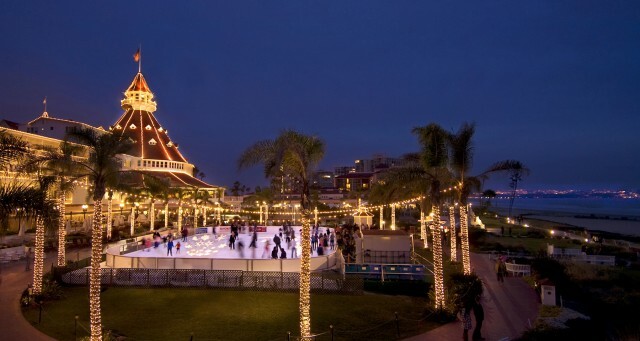 Every year the Hotel Del Coronado opens an ice skating rink adjacent to the hotel from November to January! What better way to (ironically) spend a sunny day on the beach in San Diego! 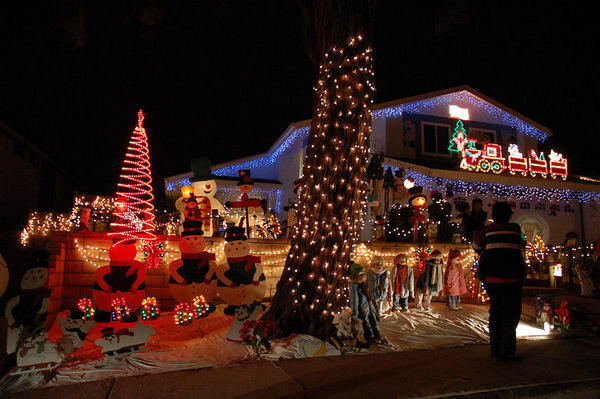 San Diego neighborhoods light up during the holidays. If you love the infamous Griswold house in the “Vacation” movies from the 80’s, then you will adore Christmas Card Lane in Rancho Penasquitos! An annual tradition, the entire neighborhood gets involved in decorating the yards around themes and is a local’s favorite! The streets are lively and many visitors rent double-decker buses and limos to tour all the decorations! I recommend parking the car and walking around on foot. Many homes offer hot chocolate for a small price and popcorn. And it’s likely you will run into some carolers singing traditional songs along the way! Where: Located in Rancho Penasquitos at Oviedo Street – off Black Mtn. Rd. includes Twin Trails, Carmel Mtn. Rd., Ellingham St., Renato St., Oviedo St., Twin Trails Dr., Barrymore St., Totherham Ave., Talca Ave., Talca Ct., Allenbrook Way, Davenport Ave., Amber Sky Ln. Every year this is the spot my family gets our traditional photo with Santa. Immediately after, we enjoy the incredible lush gardens that are beautifully lit up for the holidays during their annual Garden of Lights! We make sure to catch the horse-drawn carriage and sing carols as we tour the grounds. After, we order some of the food sold during the event and then roast our marshmallows while listening to the live music act of the night! And on certain nights, snow is brought in for sledding! This is truly a gorgeous event and a must-do during the holidays in San Diego! Mission Bay Parade of Lights! Another gorgeous way to experience the best of both worlds of gorgeous winter weather and holiday spectacular is to head to the bay to enjoy the beautiful lit up boats! And believe me, competition can be fierce for who has the best display! With dozens of participants, take in the sights and the fresh San Diego air. 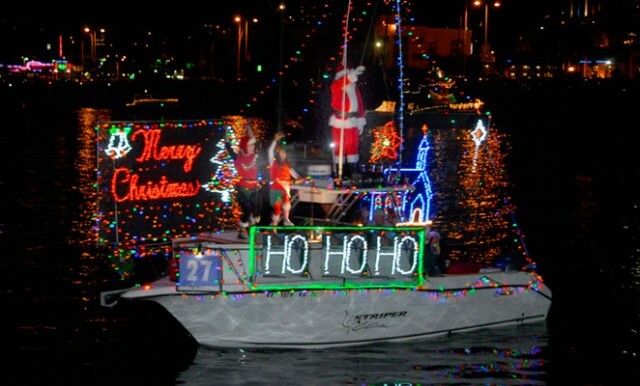 The boat parade begins at 6:00 PM from Quivira Basin. Best viewing is from Crown Point, the east side of Vacation Island or the west side of Fiesta Island. 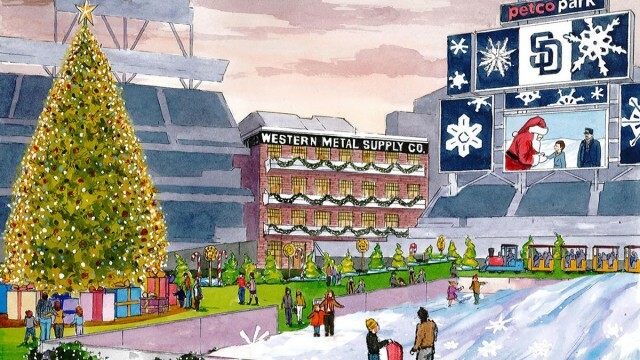 This year, Petco Park will be a Holiday Wonderland full of festive cheer, lights and plenty of ways to keep the kids happy. Make your way through Santa’s Workshop and Candy Cane Lane toward what used to be a baseball field for train rides, a hill covered in snow, reindeer, music and a place for Mommy and Daddy to relax. Just make sure to bring your camera to capture all the smiles your children will be giving you! This entry was posted in Family Vacations, Insider Tips and tagged coronado, downtown, mission bay and beaches, north county coastal by Chelsea. Bookmark the permalink.